Welcome to the online home of Pimp My Noodles, the cooking show that will change the way you look at instant noodles forever. Breaking all the rules, this fast-paced, street-food-style series takes what was once the domain of broke university students and blows it out of the water, cooking instant noodles in ways you never thought possible. From desserts to sandwiches and soups to breakfast, Pimp My Noodles turns cheap eats into delicious treats and has a serious amount of fun in the process. The recipes are easy, delicious but best of all they won't break the bank. Pimp My Noodles, it's pure noodle pimping goodness. Host Aaron Harvie is a cookbook author and overly zealous noodle consumer. He is the former host of cooking show Love to Share, as well as a MasterChef Australia contestant (series 2 and All-Stars). He has appeared on major network talk shows across Australia and acts as an independent menu consultant for restaurants and brand events. His recipes have featured in many publications including Women’s Health and Fitness, FHM, Filmink, New Idea, Woman’s Day, NW and OK.
Aaron is also the author of The House Husbands’ Guide cookbook and his new book Us & Them has just hit the shelves. Did you know that instant noodles were invented by Momofuku Ando for Nissin Foods? They were first sold in Japan August 25, 1958. The Heart Attack Sandwich recipe is based on a brothless ramen Aaron saw in Season 2 of Master of None? Did you know Instant Noodles were originally considered a luxury item? Did you know they wrapped half of Aaron’s house in black plastic to film the first episodes of Pimp My Noodles? The wavy spirals of instant noodles are formed by how the noddle dough is cut? The idea for Pimp My Noodles came from a lunch Aaron cooked for his wife… the dish was Chicken or the Egg noodles. 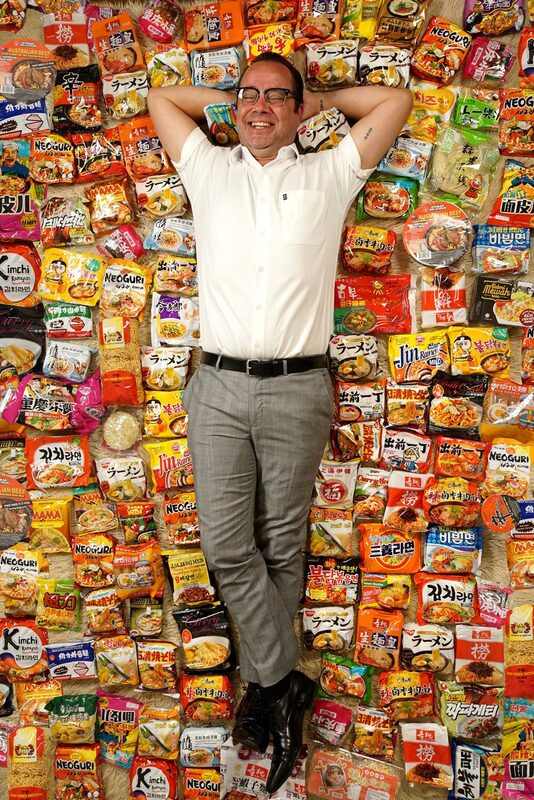 Almost 100 Billion serves of instant noodles are consumed every year? Did you know that the creators of Pimp My Noodles met on a commercial shoot where they travelled around the world, shooting in 5 countries in 16 days? Most Western nations use hot air dried instead of flash fried instant noodles?